Two groups from the Blantyre area are celebrating being awarded community grants by the Scotmid Co-operative West Regional Committee. Blantyre Volunteers Ltd received £200 in Scotmid vouchers and £200 in cash to pay for Christmas treats for the elderly and disabled people that they support and to pay for a Christmas lunch for their volunteers to thank them for all their hard work during the year. 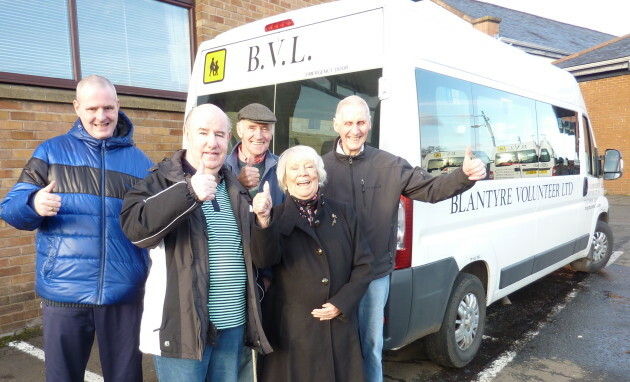 The group provides community transport and delivers Meals on Wheels to local residents who are elderly or disabled, providing friendly social contact and a regular check that they are safe and well. Myra Menagh, Company Secretary, said: ‘We’d like to thank Scotmid for its donation of £200 cash and £200 in vouchers. ‘We gave each of our volunteers a £10 voucher and used the remaining vouchers to buy goods to fill Christmas bags for the pensioners who we deliver Meal on Wheels to. We also treated our volunteer drivers and escorts out to a Christmas meal and a good night was had by all. 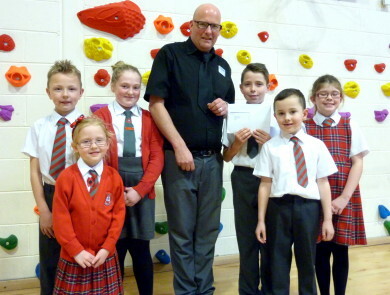 St Blane’s Primary School received an award of £500 to pay for seeds and plants for the children to grow fruit and veg in the school grounds and also to provide art material for children to produce an anti-sectarian display in the community. Bottom photo: St Blane’s Primary School pupils with Stuart O’Neill, Store manager of Scotmid Co-operative Stonefield Road branch.